A bobbin is the thread holder that feeds the stitching underneath the fabric on a sewing machine. It can hold either the same color thread as the top stitch or a different color for fancy projects. The bobbin thread stitches will remain on the bottom side of the sewing fabric and are usually only seen when the item is turned inside-out. As the machine stitches from the top side, the bobbin thread underneath secures the stitches, creating an anchor for the thread. This keeps the stitch from coming out. Tight or loose tension for the top and bottom stitches are set on the machine. A low setting on the under stitching makes it easier for the top stitches to pull out, which is particularly useful when basting two pieces of fabric together. Bobbins can be made of plastic, metal or stainless steel and are usually about 1 inch in diameter. 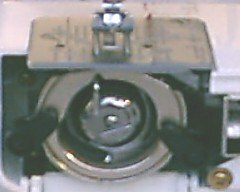 The width of the spool depends on the exact model of sewing machine, but usually runs 1/4 to 1/2 inch. There are also generic brands of bobbins available that list on the back of their packaging which models are compatible. Ready-to-use bobbins are full of thread in basic colors and need only be dropped into the sewing machine's shuttle or bobbin case, and the thread tip pulled through the plate to use. Empty bobbins are used when the seamstress wants to match the thread colors of the stitches both above and below to the material. 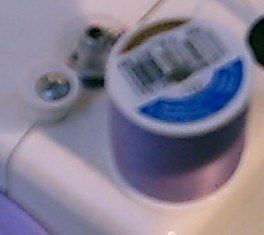 Finding ready-to-use bobbins to match sophisticated colors like lavender or jade, for example, is nearly impossible, so they must be created from the original thread spool. 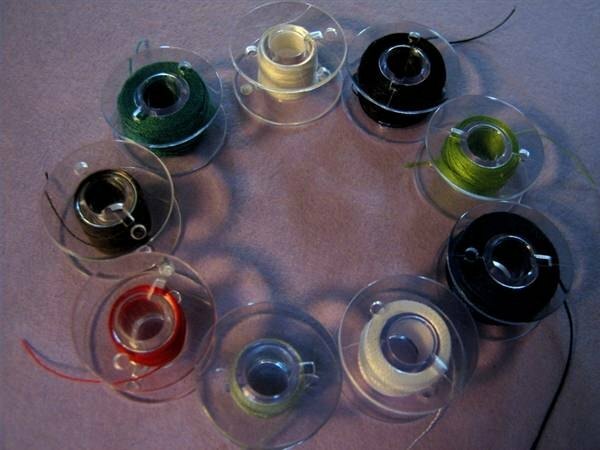 To fill an empty bobbin with the color of choice, it must first be wound from a spool of thread. Most machines have a winder on top with two spooling pins, also called spindles. For these models, begin by first disengaging the clutch from the handwheel assembly so the pins will spin without the needle running up and down while the bobbin is winding. The thread spool is placed on the feeding spindle. Pull the thread tip across and through the side of the empty bobbin with about 1/4 to 1/2 inch of thread fed through the bobbin's hole on top. Use a finger to hold the thread tip against the bobbin's top so it won't pull out as the bobbin is put on the receiving spindle. There will be a stopper next to the bobbin spindle to hold it in place, allowing it to spin until it is full. Slide the stopper over to meet the bobbin. Grasping the tip of the bobbin thread with the thumb and forefinger, gently press the sewing pedal. Both pins will spin and thread will travel from the thread spool to the bobbin. After several revolutions, release the thread, allowing the machine to continue winding the bobbin. When it is full, slide the stopper over, cut the thread between the bobbin and the spool and remove the bobbin. Snip the thread tip from the top. Re-engage the handwheel clutch. If the machine does not have automatic winding capabilities, see the owner's manual for instructions. Drop the bobbin in its holder if the machine has one, or straight into the shuttle, depending on the model. Feed the bobbin thread tip up through the plate and pull out a few inches. Once the machine needle on top has been threaded and proper tension settings are in place, sewing can begin. The Complete Photo Guide to Sewing; Editors of Creative Publishing International; 2005. Kenmore Sewing Machine Owner's Manual Model 385.15212/15218; Sears, Roebuck and Co.